She was a city girl hankering for a pastoral life, something a little more elemental. “Nature has always been a key source of comfort for me,” she said. Born and raised in Toronto, Ontario, Sharon Hunter massaged the film industry and community arts scene, eventually returning to school to acquire a Bachelor of Fine Arts from the Ontario College of Art and Design. Sharon went further, pursuing a teaching degree and hoping to use the leverage to teach art within a First Nation setting. A few years ago she landed in Attawapiskat doing just that. Three years later her gypsy soul became restless and she was ready for a new adventure. 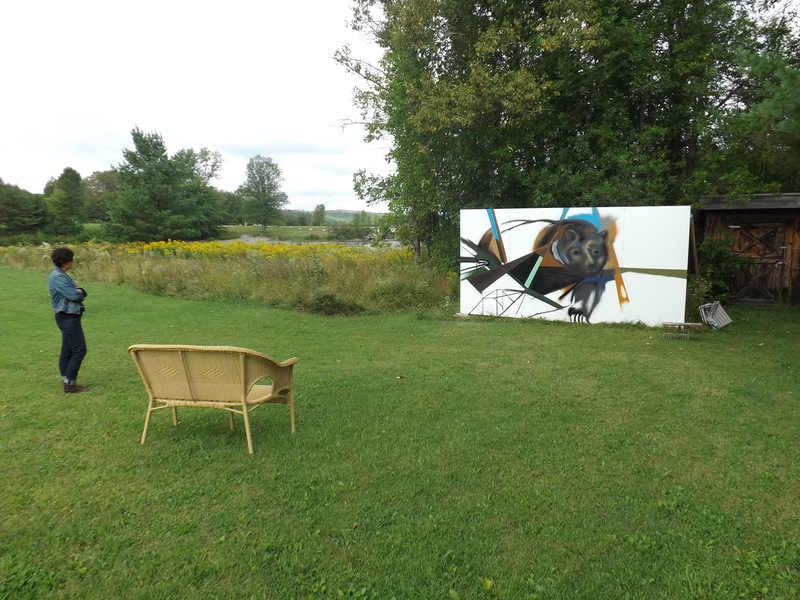 She wasn’t aiming for Rydal Bank, Ontario, when she set out but that’s where she found her next baby- a painting installation in an abandoned house up on Mount Zion Road. She settled in for a few years, picking up little grants here and there to work with communities east and west of her new coordinates. A teaching position with Mississauga First Nation in Blind River, downtown murals with youth in Sault Ste. 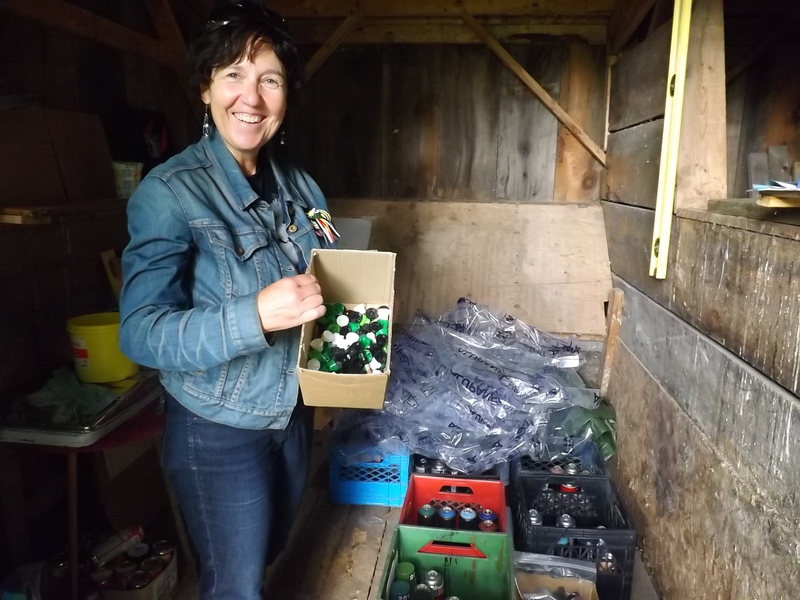 Marie and her most recent project funded by a Northern Arts grant through the Ontario Arts Council – Parallel Routes. 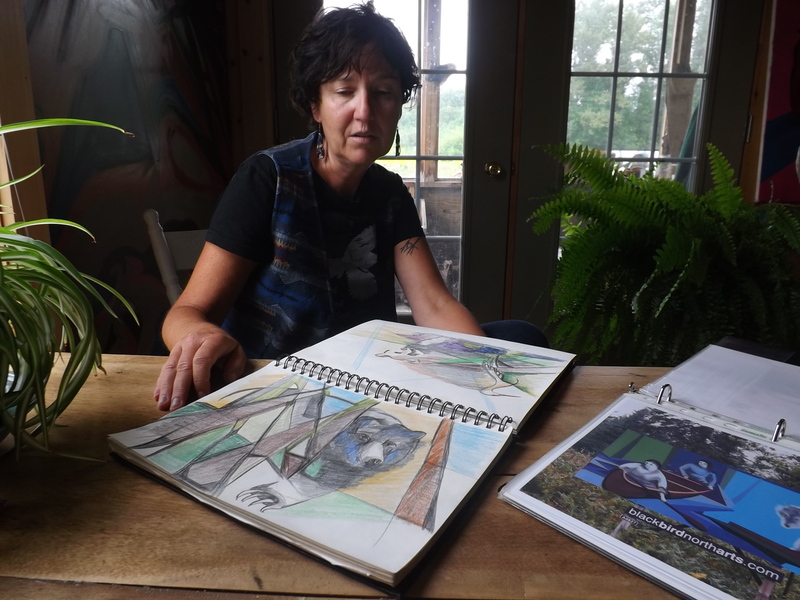 The long roads travelled by automobile everyday was a culture shock for Sharon who in Toronto, and even Attawapiskat, could transport herself through her own bipedal energy or at least by bicycle. But it was on those long drives that the concept for Parallel Routes was birthed. 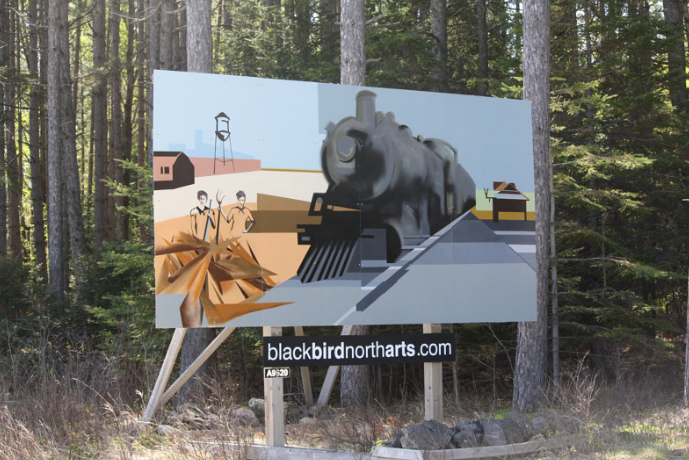 In all her hours travelling Highway 17 Sharon spotted empty billboards and saw blank canvasses. “I like galleries, they have their place. But people, they’re wandering around in the world doing their thing. An installation is part of people’s environment that they are living in. It’s in their life and it has something to do with their life,” Sharon elaborated. Parallel Routes was conceptualized by Sharon as a collaborative process with the people that live along the King’s Highway. One doesn’t just paint big billboard murals. There’s an approach that needs to be finessed. We’ve been chatting in Sharon’s cozy kitchen, sitting at a charming little table that she recovered at the Desbarats junkyard. She’s had the wood stove on and comforting scents of the burning wood and sweet grass waft through the rooms of her charming two story yellow house. Her walls are decorated with her own works as well as the paintings of her son, Misha Hunter. She discovered later in life that she was Métis. The grandparental connection to residential schools did its damage and the stories were not passed on. But something remained of the culture, of the way that life was valued and lived perhaps. Much of Sharon’s work has been critiqued at large as native artwork but she’s quick to correct the misnomer. Sharon is like most artists- scraping by on the skin of her teeth. 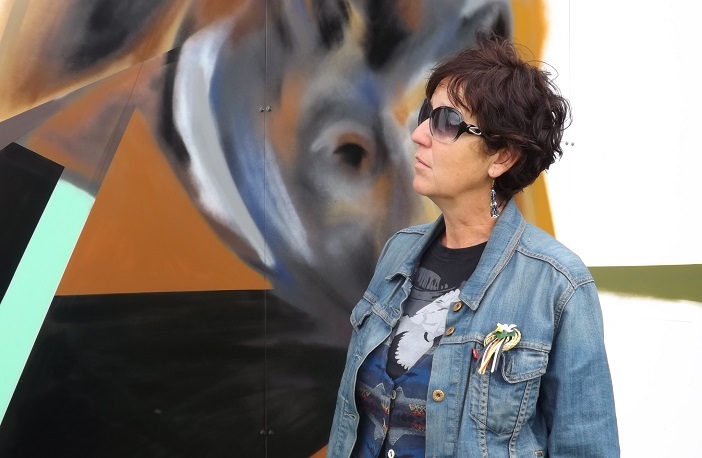 It has been a project aim that at the completion of her installation – 4 mural billboards in total, that the townships may want to purchase the relevant images to permanently display either where they are now or elsewhere. However Sharon is also amenable to selling the murals to collectors. Is anybody looking for a slick installation piece to hang on the side of their red barn? 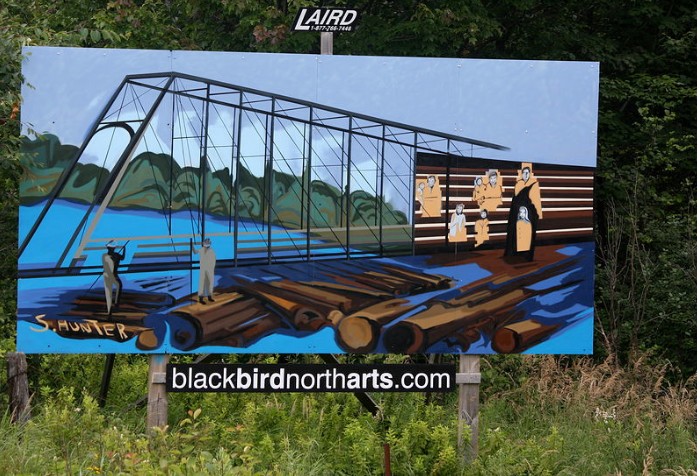 In the meantime, the grant that took care of material costs and paid a small amount back to Sharon, also covered the cost of rental space to display the billboard murals for one year. If there’s no interested buyers Sharon has two options- decommission the pieces or drum up a fundraiser to cover the rental costs for the display space. But Sharon’s taking it in stride. She’s got moxy. And she’s got to have it to survive her tough occupation. 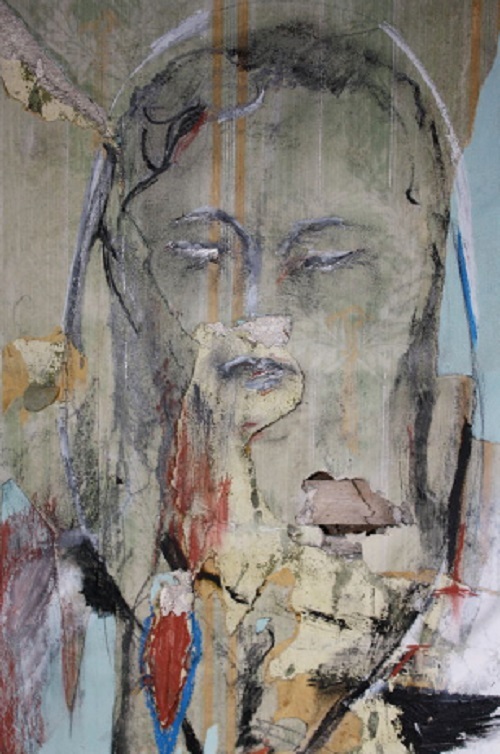 Interested in purchasing Sharon’s work? Want to commission a piece or get in touch? Check out Sharon’s website blackbirdnortharts.com.